A colourful article in a popular backpacking magazine, and a potential participant’s enthusiastic response with details about past Waterton experiences, helped to shape the objectives for this trip. With a mix of scrambling, hiking and backpacking opportunities, the trip sought to provide a balanced exposure to everything that this Peace Park has to offer. Several months of research and planning contributed to what was to become a trip of a lifetime. I offered this trip as an outing for the Ottawa Section of the Alpine Club of Canada. Three participants, Ivan, Sara & Jim, joined Kelly and I for this unforgettable experience. This page is designed to provide you with ideas for your trip itinerary, as well as recommendations for places to stay, eat and play. Our descent into Calgary International Airport was met with a reddish brown haze hanging in the air. Wildfires had been burning for some time in B.C., and the easterly winds carried evidence of their existence right to our runway. A quick stop was made at Mountain Equipment Coop for restricted items like bear spray, matches, and camp fuel and we were soon on the road headed to Waterton. 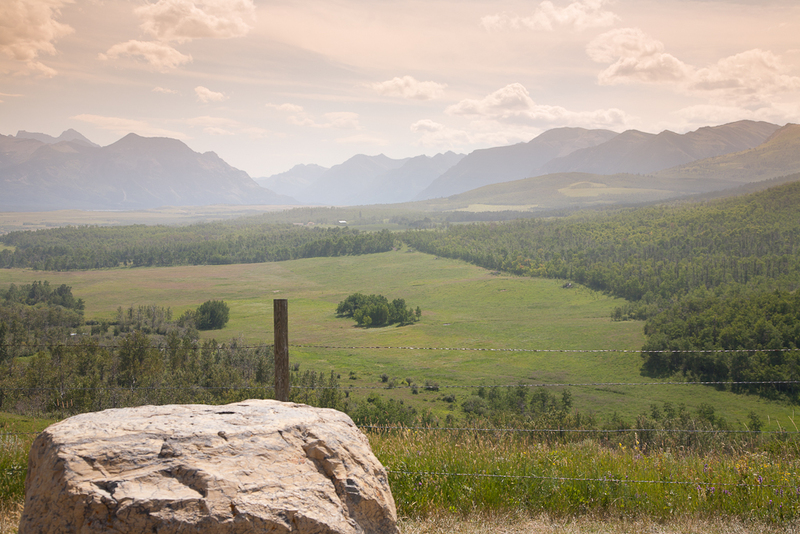 The drive to Waterton involves a 3 hour trek through Alberta ranch country. Services are available along the road in places like High River, Nanton, Claresholm & Pincher Creek where we stopped to buy a cooler and fresh produce. The haze from the wildfires was present right up until the doorstep to the national park, and we were relieved to finally see that the smoke was not going to mar our trip. We settled into our campsite within the Townsite, and later purchased our water taxi tickets to get to the trailhead for the Crypt Lake trail. Jim, Sara and Ivan had been in the region for a week already pursuing other hiking opportunities, and joined up with us at the campground. Sections of the trail are not for the faint of heart. In fact, spending our first full day in this area on ledges after arriving from Eastern Canada the day before is ill advised, and did not provide any opportunity to acclimatize to the alpine environment! If you are from the East, invest a day on a ledgeless trail before undertaking this hike. Click here to read my post on this outing. A lot of nervous anticipation lead up to the morning of our trip – this would be my first ever scramble. A fellow member of the Alpine Club’s enthusiasm for this trek provided the fuel, and a fair amount of research provided much of the confidence I would need to lead this outing. It turned out to become a big, long and rewarding day, and I will carry positive memories of this excursion to my grave. Given the time it took to complete most of the Horseshoe, we had to forego the 3rd peak (Mt. Lineham), and take a well established trail down from the ridge to the Rowe Lakes meadows. I had (and still do) have a bum right knee. I favoured that knee and scrapped my left knee on the descent to the meadow. Other posters have commented on the downhill strain of this trail and how it would actually be easier to descend directly from the summit of Mt. Lineham via the scree slope – I would tend to agree with them. Click here to read my post on this outing, and remember to bring lots of water with you (it was a long and hot day on the ridge, and I nearly depleted my 3l supply of water). Given the demanding day we had doing the Horseshoe, the late arrival time, and my newly injured knee, this day was all about taking it easy. We used the day to get some rest, and load up on provisions before catching our water taxi to start our two day backpack into the U.S. side of the park. We caught the last water taxi of the day toward Goat Haunt. The border crossing at Goat Haunt is pretty unique. Two U.S. Customs and Immigration officials are posted at the far end of the bay from where you get dropped off by the water taxi. 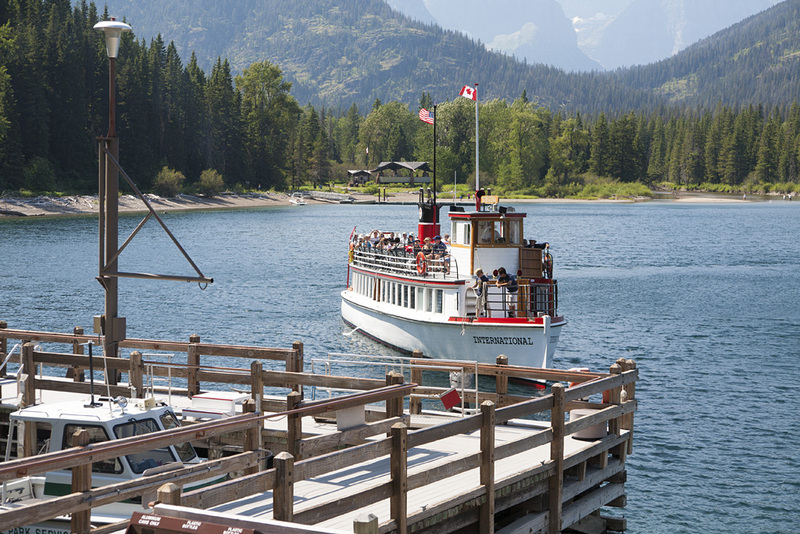 The dock is next to the hiker shelters, but you must report to the border crossing before the officials embark on the last water taxi brining them back to Waterton (there is no road access to Goat Haunt and the U.S. officials actually get home at the end of their workday by entering Canada and crossing back into the U.S. at Chief Mountain). We were somewhat stressed by having to check in with Customs within the 30 minute window that the boat was at the dock. There were few hikers with us, but several passengers making the round trip got in line to have their passports stamped as a memento. Given the pain that I was now feeling in my left knee, I had to muster all of the positivism possible as we were leaving Goat Haunt campground to head out along the Boulder Pass Trail toward Hole in the Wall campground. This is probably the point where I should mention that I had studied and understood the nearly lottery like chances of obtaining permits for two campsites in one of the most highly rated campgrounds in Glacier National Park. As most backpackers do, we dutifully headed off toward our destination after having a simple breakfast, and packing up our camping gear. Unfortunately for me, the slightest downward pressure on my knee provided excruciating pain at every downhill, and lead me to question my ability to continue with this part of the trip. We took our first break at Janet Lake, and it was at this point that I decided that it was best to turn back and catch the next boat leaving Goat Haunt for Waterton. My beautiful and supportive wife and I headed back, while the other 3 members of our party pressed on toward our intended destination. Of course, they had a great time and the campground was every bit as beautiful as the guidebooks described it! On the up side, we treated ourselves to a very comfortable stay in a motel back at the townsite, as well as an excellent evening meal out at Bel Lago. Part of this day was spent waiting for the other members of our party to return from the Montana side of the park. We did some tourist stuff, and rented bicycles from Pat’s to check out everything near and far from where we were staying. This slideshow will provide you with a tour of the townsite. The day was capped with a group dinner that evening at Trapper’s Mountain Grill, and marked the formal end of the group portion of our trip. Now that we were back to being just the two of us, we could indulge in activities that might not have been of interest to the larger group. This day allowed us to take in the Red Rock Canyon. We availed ourselves of the free shuttle service to get from the townsite to the Canyon. At the time, it was pretty much the only way to get there since the parking lot was closed due to construction, and Parks Canada would not allow vehicle travel beyond a certain point on the road in. The shuttle service was great and would definitely be a viable option whether you have access to a car or not. The exposed rock within the canyon was beautiful, and we hopped the fence to get down to the creek level to see the canyon up close. My only disappointment was with the size of the canyon itself – it is not deep at all. 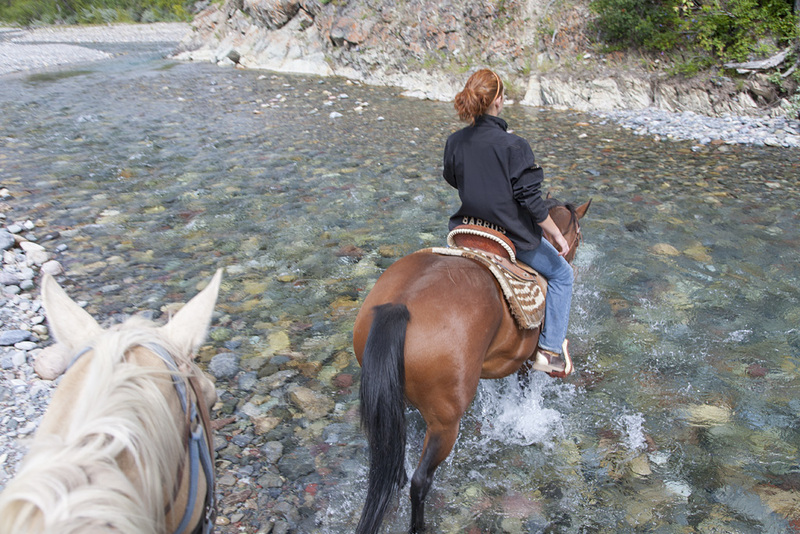 Later that day, we also enjoyed a 2 hour horseback ride with Alpine Stables just outside the townsite. I had not been on a horse in several years, and it took a few minutes to get comfortable with my 4 legged transport. We rode over coulis and into streambeds. We also rode down a fairly steep staircase (despite leaning as far back in the saddle as I could, I still felt like I was going to fall forward off the horse) and through fields of saskatoon berries (yum!). This would be our last full day in Waterton before heading back to the airport to fly home. Another laid back day where we spoiled ourselves with high tea at the Prince of Wales Hotel, and bison tenderloin for dinner at Vimy’s Lounge and Grill. We chose the front country camping option for a portion of this trip. The location put all of the townsite services within a 15 minute walk of our campsite, and ensured that we would have access to a hot shower at the end of each of our active days in the park. We also combined some economy lodging during our group’s itinerary. The motel nights were planned for the eve of our backpacking trip on the Montana side, as well as our final group night upon the return from Montana. This place is clean and cheap (compared to other townsite options). Wifi service was available. TV reception was sketchy (antenna), but we didn’t come all the way out here to watch TV anyway. The staff was very friendly and I would stay here again. We stayed here after I had to abort the backpacking trip in Montana due to my knee. It is a step up from the Bear Mountain Motel in both price and quality of the facilities (Wifi and reliable TV signal). I would also stay here again. We splurged for the final two (non-group) nights and stayed in the Romantic Suite. What better way to say “thanks” to your travel and life partner? This is one of the most expensive options in Waterton, and budget permitting, I would stay here again. Erik Molvar: Hiking Glacier and Waterton Lakes National Parks. This guidebook is full of practical information to help you plan your backpacking and hiking outings.